Calling all stylish ladies. These fashionable chic frames for women are the must-have eyewear accessories this season if you want to remain in those competitive fashion circles. Your natural shorter nose will be complemented and balanced with the eyeglasses modern high bridge. These plastic Coach HC6040 BROOKLYN eyeglasses have been created with a careful blend of plastics, ensuring the highest quality lightweight eyewear for you. 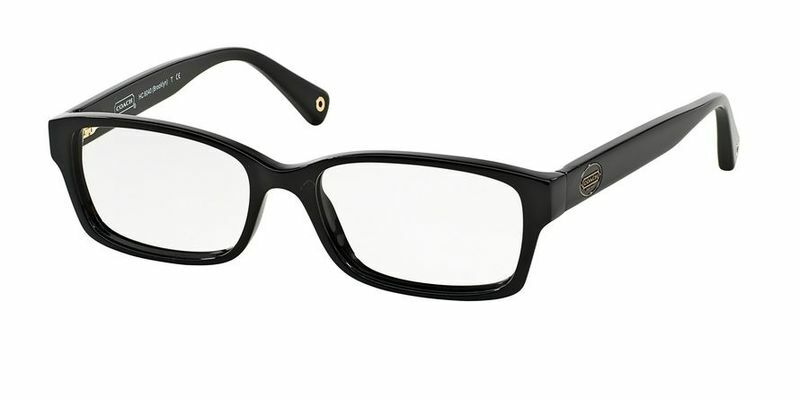 The use of a number of plastics isn't accidental, and the final result is a unique pair of plastic Coach HC6040 BROOKLYN eyeglasses that will help carve out your own individual style. If you have a higher nose bridge, you might find a pair of eyeglasses with nose pads might be a comfortable option for you. Full-rimmed eyeglasses are a hot favorite among the youth. These thicker frames allow you to experiment more with color and style while fully protecting your lenses. These vintage inspired couture butterfly frames will have you feeling like you're the queen of all. Rock this classic boho look and hide behind your larger than life frames, because these sunglasses will surely draw attention to your natural beauty and bring more balance to thinner faces. These carefully crafted timeless frames will help you adapt to any style. If it's �professional' you're going for, these classic frames will help leverage your professional look - and if you're looking for a career change, you'll surely be hired, because everyone appreciates a bit of classic beauty and competence now and again. Oval shaped faces will look amazing with these rounded Coach HC6040 BROOKLYN frames with high temples. Very pleased with the amazing prices for new glasses on this site.